2) In a medium bowl, cream together the sugars and shortening using an electric mixer. 3) Mix on slow speed 30 seconds, then scrape down the bowl with a spatula. 4) Increase speed to medium and mix for 3 minutes. 5) Slowly add vanilla and beaten egg while mixing. 6) In a separate bowl, combine the flour, baking soda, baking powder and salt. Gradually add the flour mixture to the mixing bowl, mixing on slow speed until just blended. Do not overmix. 8) Place directly on cookie sheet. 9) Bake at 375° for 9-10 minutes. Cookies are done when small cracks appear and are pale golden. Ideally, the edges do not brown. If making cut out cookies form dough in to two balls, chill dough in refrigerator for at least two hours covered. Roll out dough on floured surface and cut out cookies with desired shaped cookie cutters. Place directly on cookie sheet. Bake at 375° for 9-10 minutes. Cookies are done when small cracks appear and are pale golden. Ideally, the edges do not brown. Decorate with Buttercream Frosting or Sugar (See recipe below). Thank you so much to all of you who have sent kind condolences on my mother's passing. It is truly appreciated. My creative spirit will be back soon. I can't help thinking of your when the words Magnolia Bakery are mentioned :) They are so pretty, Debbie! You and I must share the same sweet tooth, Debbie! I wish we could share a cookie (or two) with a cup of tea or coffee and chat the day away. Oh, for cryin' out loud...how delicious must this be?!! The top photo alone got me wanting some! I am not the best when it comes to icing cookies, but you did a fabulous job on those! I'm saving the recipes for when I'm up and able to bake again. Can't wait! Happy Valentine's Day! So very pretty! I'd love a cookie like this! I am such a nut for sugar cookies. I haven't tried the Magnolia Bakery recipe yet but I sure need to! These are so beautiful. I am afraid I wouldn't stop with one though! Hope you had a wonderful Valentine's Day! These look so good and the recipe for the magnolia frosting sounds yummy! 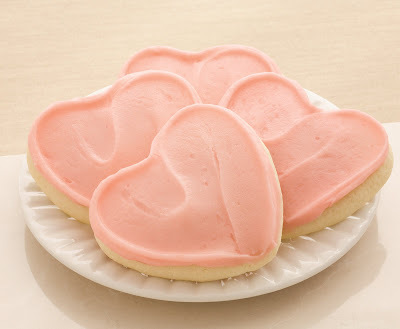 Love how you frosted the cookies- perfect!